Caledonian Sleeper. Glasgow to London. 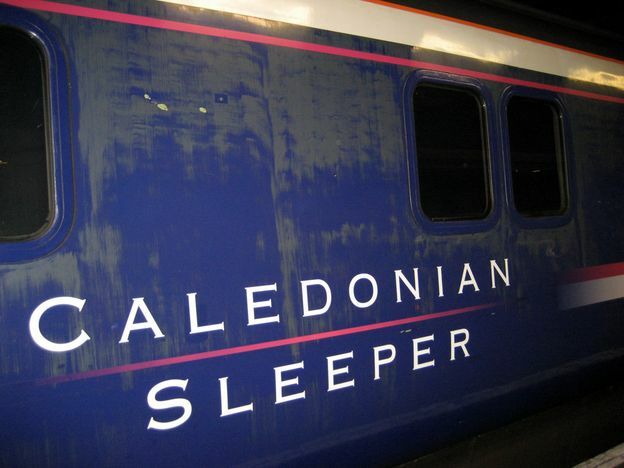 It’s all change for the Caledonian Sleeper that connects London Euston overnight with five Scottish termini: Edinburgh, Glasgow for the lowland sleeper and Fort William, Aberdeen, Inverness for the Highland sleeper. On 31 March 2015, Serco Caledonian Sleepers Limited took over the operation of the Caledonian Sleeper as an independent franchise and I was on board one of the first journeys to report. I made the journey from Glasgow to London Euston, a decade ago and was impressed by the cosiness and speed of the service; though I have to say that staff performance was memorable for all the wrong reasons. They went through the motion with bored detachment which flicked to a somewhat manic pace on arrival. As a result, I was hurried out off the carriage, in the early hours of the morning, onto an eerily deserted platform, with half a croissant in my mouth, unkempt hair and bags strapped the wrong way up. On the other hand, the iconic Caledonian Sleeper train service between Fort William in the Scottish Highlands and London was named as one of the best six railway adventures in the world. Which was it to be with the new service: Sweet dreams or nightmare? our train adventure started at the carriage door with welcoming staff dressed to impress. Alan Moore of Glasgow fashion-house ten30 designed the new uniform using Harris tweed to introduce a unique tartan. Each colour represents a different destination on the train’s journey. The grey for the Granite City of Aberdeen, sky blue for Inverness, a vibrant green to depict Glasgow deep violet and cobalt blue for Edinburgh, dark red for Fort William and stripes of red and white to depict London and the two countries connected by the Caledonian Sleeper. It’s not only a change of clothes; the new Caledonian Sleeper is working with Scottish partners from interiors via food and drink to technology to showcase Scottish products and services. The menu has been transformed to take advantage of Scotland’s produce. So it was with great anticipation that we ordered porridge and Venison sausages for breakfast, not on the same tray, I haste to add. New carriages have not arrived yet. In fact, the promised 72 state of the art carriages, a service fit for the 21st century, won’t be in service for another two to three years. As a prelude to their arrival, you get a nice Arran aromatics sleep-over kit with shower gel and all, though no means to use any of it just yet. For the time being each compartment is equipped with the traditional narrow bed a sink and a communicating door in first class or bunk beds, Hitchcock’s North by North-West style, in standard class. 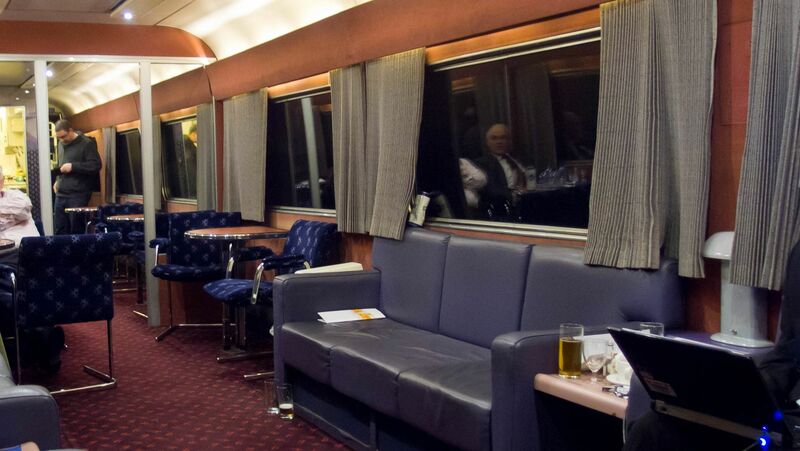 Serco promised improvements include en-suite berths, WiFi, ‘pod flatbeds’ and a brasserie-style club car. First class carriages felt roomy, bed linen soft and fresh and it wasn’t long before after laying my head on the pillow sprayed with aromatics that I joined the land of nod. If you opt to try out the service for pleasure as opposed to going from A to B, there is something to be said about travelling south. As when going north the carriages split in the early hours of the morning breaking up your night which doesn’t happen the other way. 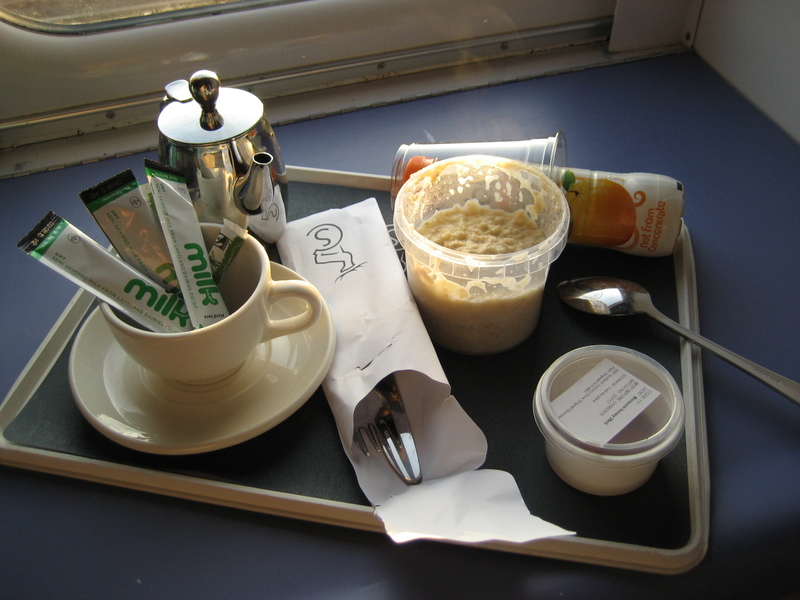 Awakened by a gentle tap on the door, breakfast was served with a smile by the on-board steward. Coffee, Creamy Highland Porridge with Caithness honey were perfectly acceptable. As for the long anticipated full Highland breakfast, I was reliably informed that, “It was not….full or fine” the reason for this “outrage” was that, “Half the venison sausage was missing”. We were still discussing the missing banger as we alighted at Glasgow central. Now wishing we had added the Highland journey and super-glued our noses to the window to awe at the stunning scenery. The refreshed Caledonian Sleeper is definitely an improvement. 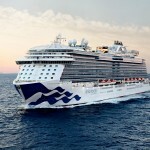 The planning, expertise and focus on hospitality has started to kick in. 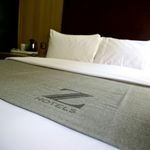 One of the best things about the new service is the staff and of course nothing beats getting all snug in fresh linen knowing that next time you’ll open your eyes you will have arrived at your destination. 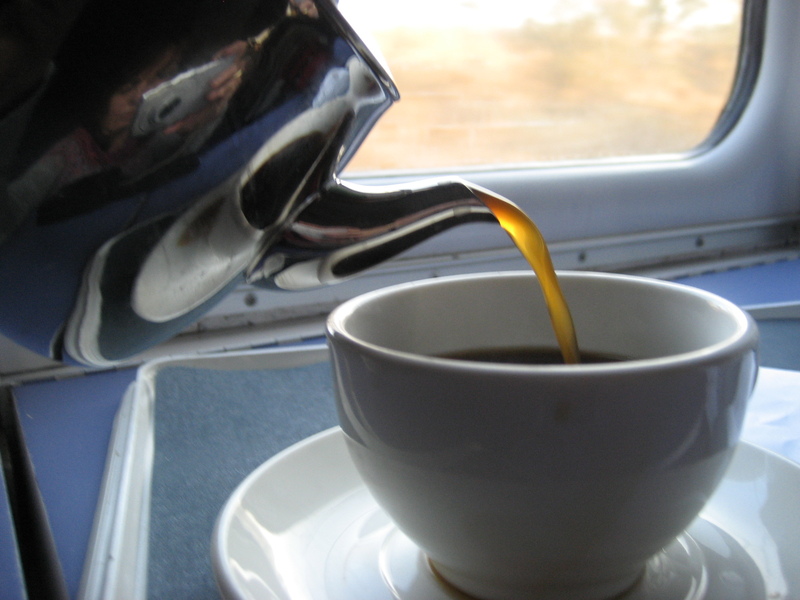 I want to travel on the Caledonian Sleeper how much does it cost? First of all I would like to ask the question how one can possibly review a service which has just been taken over and make comparisons on an event which took place ten years ago? Regarding your comment on the staff, as a very frequent user over the past three years I would think I was in a better position o comment on the staff, and for the rest of the world at large I would like to tell you you will have a very professional and happy experience. On another point you mentioned the menu and food, well firstly the prices have increased on some items by over 50% and not for better quality, secondly you commented on the food again proof that you never sampled the previous food, as I and many other passengers will tell you certain changes in the food supplier are truly awful the taste rubbish. I could go on and on but your review has so many flaws I do not think it deserves my time to review your review. I hope other people who have read your review read this. Over all the sleeper is a very good service with great staff, but as all changes in management we now have a company who is more interested in good marketing making sure they get good reviews and spending time and money on this and not the customer. Solange replies: It’s always good to read comment thanks Duncan. As a travel writer, my experience is a snapshot and from there I formulate an opinion (hopefully as objective as possible). It bounds to be a different perspective from people who use the service regularly. From what I read in the Caledonian sleeper magazine, regular commuters get to know one another and to know the staff which creates a different dynamic. I felt privileged to be one of the first to use the service run by the new company, the current changes re: uniforms, sourcing food in Scotland whenever possible may not add much but are important to create a new image for the train service. I can’t comment on the increased price but I did on the mixed quality of the breakfast. As for money spent on the customers when Serco will achieved its goals (new carriages, Wi-Fi etc..) this will definitely have a visible and positive impact on the customers, though on the negative side it will probably increase the price. Note to travellers who’re thinking about taking the Caledonian Sleeper train. DO NOT TAKE THIS TRAIN. You’re better off taking a bus or a regular train. My train ride there was horrible, the train doesn’t move at a steady pace, it jerks to accelerate and brake constantly throughout the night. Heating is ridiculous, at the beginning it was burning hot and in the middle of the night it just went off, making the entire carriage cold as hell. 4 hours before my return journey back to London from Edinburgh, the company just calls to tell me that “due to unforeseen circumstances, we have cancelled the Edinburgh train so you’ll have to go to Glassgow to catch the train”. I took a coach back to London and it’s a pain to refund tickets when they make you post the form. DO NOT TAKE THIS RIDICULOUS TRAIN SERVICE. it seems you certainly had a bad experience! Had you used the train before this or since? You seem to have been unlucky. Cancellations are rare, and the heating usually controllable in the cabin (although this may not be well explained). Jerky stopping and starting can be disruptive but isn’t usually very frequent. I was frozen on the train back from London to Glasgow (summertime). That was in spite of being shown how to adjust the control in the room which the ‘Ambassador’put to Max when I had said to him that it was cold, when I entered the room. I had to empty a drinking water bottle & fill it with scalding hot water from the tap (not very Health & Safety) to get any sleep as felt I was in a tent. On the journey down to London, the ‘Ambassador’ had said he’d put the Air conditioning off because too cold but he also put on the heating (which he said has to go through all carriages) when I complained that I would never be able to sleep if frozen & this worked fine. The worker, on the return journey, said he would have moved me to another room-when I told him the heating still hadn’t worked in the morning-that I should have buzzed (why not say that when I said it was cold initially?). On both journeys, the nearest toilet (with footpump on floor) didn’t work nor did the window blind (even when staff tried it) so like being in a Cell.At approx £200 each way-for what is termed ‘first class’ it really is just Standard. Lovely staff, fresh bedding & cooked breakfast or any amount of useless accessories (shower gel when no shower)do not compensate for what I was paying for-a sleep during a long journey. This was compensated because ticket includes access to the 1st Class Lounge at Euston which includes showers (with more shower gel!) with shampoo/conditioner & free hot/cold drinks & snacks. If you are getting the train at 23.50-the lounge shuts at 11pm so you can only access c1hr before your train-rather than 2 hrs as advertised-though the Sleeper allows you access at 23.00.I would not travel with SERCO again unless Trains upgraded or prices reduced to what they were pre-Serco (substantially lower-I heard c40% from a Scotrail worker) & their heating is fixed (also told by Scotrail worker they had heard that SERCO had ongoing problems with it since took the Caledonian Sleeper over). Good feedback. I am always interested in how suppliers respond to customer complaints. Obviously, in the service industry things do wrong and for me it is always how these issues are treated that counts. How long ago did you travel, and did you send in an official complaint? Hello, For some obscure reason the heating system on sleeper trains is often a problem but usually, attendants are away of their clients’ discomfort and do their best to sort the issue. It sounds that this was not the case on this occasion. Nothing worse than being cold at night. It’s a while now since I wrote this article so thank you very much for giving us an insight into the current service. In reply to your question-I travelled Summertime (as I said)-this year. I had previously complained about the price having been increased because of new booking system-intended for new carriages (with Wifi/en suite/socket) for same old carriages (without any of these which might justify sharp increase). It took weeks before I got a satisfactory response to this complaint but I did get an upgrade for the return journey so won’t be taking it further post journey. I gave feedback about all of this through a Survey Monkey from the service, when I returned. I’ve posted here to help inform others about this as I am concerned that a low tender possibly out-priced/won this contract from British/Scotrail (not sure)by a Company who is then over charging customers for the same service previously offered. Railcard users beware, Caledonian Sleeper have decided to no longer honour senior and other discount cards when you book their twin berth cabins. They claim it is because of the new trains – actually it seems to just be a convenient revision to their booking rules to extract more money from their passengers. 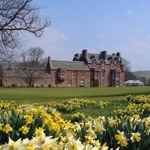 The website gives the impression that the discount has been applied when booking – but it hasn’t. Disappointing behaviour!